Team SCMA attended the Pittsburgh Jiu-Jitsu Classic in Delmont, PA on Saturday, June 17th. 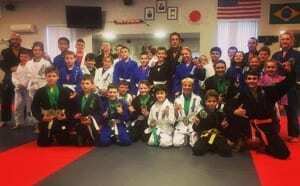 A number of people competed, and Sensei, Santino, Don, and Levi were on hand to coach and cheer the competitors. Most of our competitors were in the kids’ divisions, and everyone did well and had a great time. Colby did a nice job competing in the Adult bracket for the first time, and not surprisingly Jake, Dave M., Dave K., and Big Bill made us proud in the Blue, Purple, Brown, and Black Belt matches, respectively. Students do not have to compete at SCMA in order to advance in rank, and in fact most of our students do not compete. However, for those that choose to compete tournaments are an opportunity to confront fears, operate outside the comfort zone, and develop some very special memories. Feel free to speak with any of the SCMA instructors if you are interested in competing or just have questions about Jiu-Jitsu competition.